The Art and the People of a Kapingamarangi Village on Pohnpei, FSM. 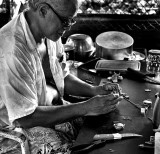 There are many artisans in the Kapinga village. 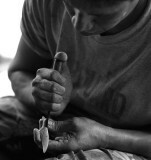 Carving and use of plant materials is something that represents their culture. A file, ground down to make a carving implement is one of the most popular material for this purpose. A couple of the carvers I spoke with had tried professional carving blades but they do not hold a good edge. A good file, carefully ground so that the temper is not lost, seems to work best for many carvers. The atoll of Kapingamarangi lies to the southwest of of Pohnpei at a distance of approximately 500 miles distance. 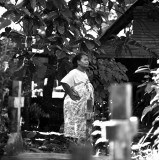 A number of Kapinga inhabitants first came to Pohnpei in the mid 1800's. Currently the population on Kapingamarangi is around 300 and on Pohnpei there is a population of 500 and about 300 Kapinga people live in the US. An adz is also often used to do the rough shaping of what ever is being carved. For materials that many of the women use in their work, different palm types have specific uses and pandanus tree leaves are used. Many of the carving of the Kapinga community are museum quality. Porakiet (Kapinga name for their community). While living in Guam during the 1970s thru 1990s, a close friend traveled through Micronesia and purchased various woven trays and a carved coconut seat and husker/greater. I wish that I could send you a photo of this interesting carved object. However, I'm wondering whether it was carved by carvers on the atoll of Kapingamaringi, Pohnpei. WHENEVE I MISS HOMETOWN,I VISIT THIS SITE..
dime waa bolo sadau mmadua maadua nadau hagabaubau kabemee gu kilamai dadou danginei emomour mai nia mee anei. Me, my husband and 4 year old daughter arrived in Pohnpei in January of 1995. We lived there for 3 years. My husband worked as an attorney at the only law office on Pohnpei, originally owned by an American ex-pat. We bought many of the Kapinga carvings and mobiles. They are wonderful works of art. I also helped sell some of their carvings in Hawaii for a while. Not sure how far and wide they are known, but the Kapinga art is a treasure. I'm currently working on a memoir about our experience there. Luckily I kept a diary! I visited the village on Pohnpei many years ago and still have a mobile of 8 different exquisitely carved sea creatures hanging in my home. The skill of the Kapinga is amazing and should be more widely known. Sites like this help. Thank you for bringing back good memories. I am interested in buying some of these awesome crafts on line. Been away from home too long and I would like to display some of these talents in my house and work (University of Hawaii - West Oahu). Very nice photography I and joyed to looked at them, Thank you for your shaing your photos the last time I was on Pohnpei was 2008 in may! I visited the village as a USAF Navigator in 1986. Would love to get a tail for the manta ray in my mobile. Is there anyway to purchase these beautiful wooden objects, without paying to actually go, though I would in a second if I could. Aroha atu ki te tagata igoa heger paul,no te kaiga katoa. Any way I can purchase some of these fine Crafts online?? It's the art of Kapingamarangi,. I wish I could buy more of these wood carvings for my collection -- they are beautiful works of art. Could you please let me know if there is a way to purchase online or order through a local (Pohnpei) shop? My email is cookie1993@live.com Many thanks. Years ago (about 1979) I was fishing for tuna with my father on board the Jeanette C. One of the crew members was named Benny Katz (spelling) from Kapingamarangi. He was a very good fisherman. The boat had the chance of passing by Kipinga. Benny was very talented and I have often wondered what happened to him. If anybody know please let me know. enjoy. Keep up the good work, ahui hou, malama pono pu, aloooha! Nice pictures, this is where I grew up and now I'm too far from there. I wish the cost of going over there is cheaper than what it is now.